Sometime in 1888, Vice Admiral Sir Nowell Salmon, VC, KCB, was cruising off the coast of Borneo according to the newspaper The Illustrated London News on 13 October 1888. He stopped in Brunei and met Sultan Hashim Jalilul Alam Aqamaddin ibni Sultan Omar Ali Saifuddin, the 25th Sultan of Brunei. Sultan Hashim ascended the throne in 1885 after the death of Sultan Abdul Momin. Vice Admiral Sir Nowell Salmon was the commanding officer of the British Naval squadron on the China station. The newspaper also reported that the island of Borneo had not yet been thoroughly explored. It noted that there were three states, that of Rajah Brooke’s Sarawak, the area occupied by the British North Borneo and Brunei. 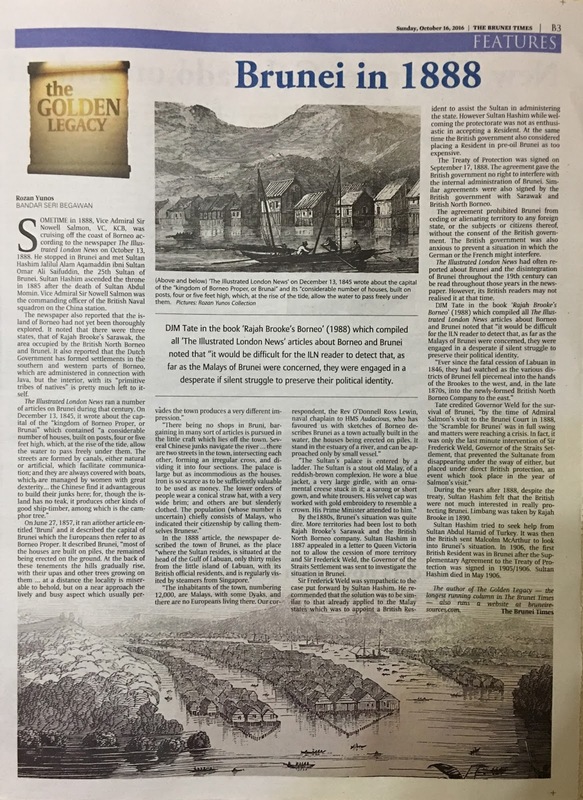 It also reported that the Dutch Government has formed settlements in the southern and western parts of Borneo, which are administered in connection with Java, but the interior, with its “primitive tribes of natives” is pretty much left to itself. By the1880s, Brunei’s situation was quite dire. More territories had been lost to both Rajah Brooke’s Sarawak and the British North Borneo company. Sultan Hashim in 1887 appealed in a letter to Queen Victoria not to allow the cession of more territory and Sir Frederick Weld, the Governor of the Straits Settlement was sent to investigate the situation in Brunei. Sir Frederick Weld was sympathetic to the case put forward by Sultan Hashim. He recommended that the solution was to be similar to that already applied to the Malay states which was to appoint a British Resident to assist the Sultan in administering the state. However Sultan Hashim while welcoming the protectorate was not as enthusiastic in accepting a Resident. At the same time the British Government also considered placing a Resident in pre-oil Brunei as too expensive. The Treaty of Protection was signed on 17 September 1888. The Agreement gave the British Government no right to interfere with the internal administration of Brunei. Similar agreements were also signed by the British Government with Sarawak and British North Borneo. The Agreement prohibited Brunei from ceding or alienating territory to any foreign state, or the subjects or citizens thereof, without the consent of the British Government. The British Government was also anxious to prevent a situation in which the German or the French might interfere. 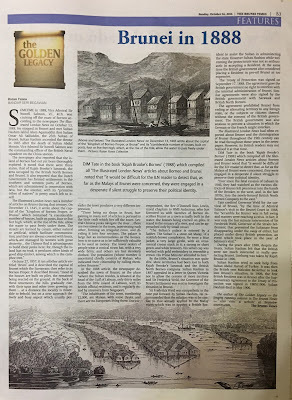 The Illustrated London News had often reported about Brunei and the disintegration of Brunei throughout the 19th century can be read throughout those years in the newspaper. However, its British readers may not realised it at that time. During the years after 1888, despite the treaty, Sultan Hashim felt that the British were not much interested in really protecting Brunei. Limbang was taken by Rajah Brooke in 1890. Sultan Hashim tried to seek help from Sultan Abdul Hamid of Turkey. It was then the British sent Malcolm McArthur to look into Brunei’s situation. In 1906, the first British Resident was in Brunei after the Supplementary Agreement to the Treaty of Protection was signed in 1905/1906. Sultan Hashim died in May 1906. Great blog! please keep it up :) is there anyway to subscribe for newsletters/notifications for when you post?